I recently contacted Vanguard US about testing some of the monopods they manufacture. My plan was simple. One high end monopod and one low end monopod. The Vanguard VEO AM-264TR monopod rests after another long, hot, hard evening of shooting rodeo. I would imagine that a lot of photographers do not think about monopods. Fact is there are a lot of us that probably never, ever need a monopod. If we do, then most of us do what we did when we made that first tripod purchase. I know I did. A trip to the local store and fifteen dollars later, I had a monopod. I have had somewhat mixed feelings about that particular monopod. I would be happy using it for awhile, and then I would ditch it. It also does not breed confidence that it will hold up for any amount of time. When this article is published, I will have just finished up spending the last couple of months shooting junior rodeo. I have been perfectly content shooting without support. On the other hand, my shoulder has not been content. After raising and lowering the camera with a 70-200 attached, my shoulder would silently curse me. Enter the Vanguard VEO AM-264TR monopod. As soon as the package arrived from Vanguard, I tore into the box. I was really looking forward to touching a real monopod and this one did not disappoint. What sets this tripod apart from most of what is on the market is the three retractable legs. The second thing that will be noticed is the weight. Weighing in just under 2 pounds, this monopod has some heft. 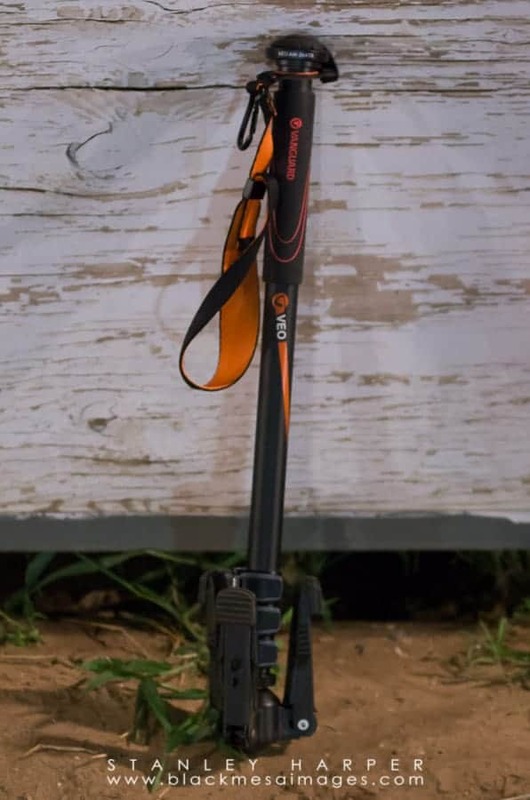 For comparison, the same model monopod that has no legs weighs 1.23 pounds and the carbon fiber model Vanguard offers weighs in at a scant .75 pounds. If you are a weight conscious photographer, then you might take that into consideration if you need a monopod. 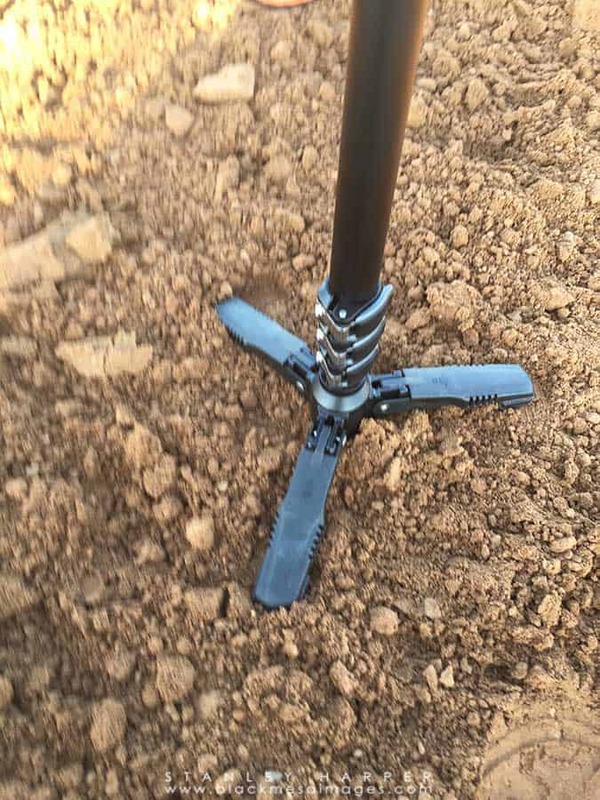 The three retractable legs allow improved stability of the monopod. Build quality is excellent. The leg locks are far superior in quality than the one's on my Vanguard tripod. The ones on my tripod are excellent and after some hard use over the years, they are holding up just fine. I imagine the leg locks on this monopod will last longer, and they look and feel like they are more secure. Do not try this at home boys and girls. The stability is tested by letting go of the monopod while it holds up my K-5 II and 70-200mm. Another feature is the ball joint at the bottom to allow some movement since this monopod has the three legs. Those of us that shoot off monopods know that we will be pivoting the bottom from time to time and the ball joint allows the photographer to do this, even with the three legs on the bottom. Also included is a rubber cap to protect the threads where the camera screws into the monopod, a hand strap and a snap ring. The folded length is 22.25 inches and it extends up to 64.13 inches and once you have the camera mounted, the monopod is going to be in the range of most photographers. The load capacity is just over 13 pounds, so this thing is going to handle most everything you want to mount on it. In fact, Vanguard offers a monopod for videographers with an pan head and this is the monopod that they used. I was in the middle of shooting junior rodeo when I reached out to Vanguard. My opinion was if I was going to give a monopod a fair review, throw it in the dirt and spend hours shooting. From shooting at my preferred position of aiming up at the contestants to standing up, the monopod handled everything like a boss. Gone where the days when I was worried that my $15 monopod would collapsed. I felt that the monopod was strong enough to hold up to the weight it was bearing. During my last use, I did notice a leg lock had lost some tension. That is easily fixed by the supplied allen wrench. Although there might be some movement limitations with the three legs folded out, the ball joint did as advertised. The monopod doubles as a makeshift tripod for my action camera. 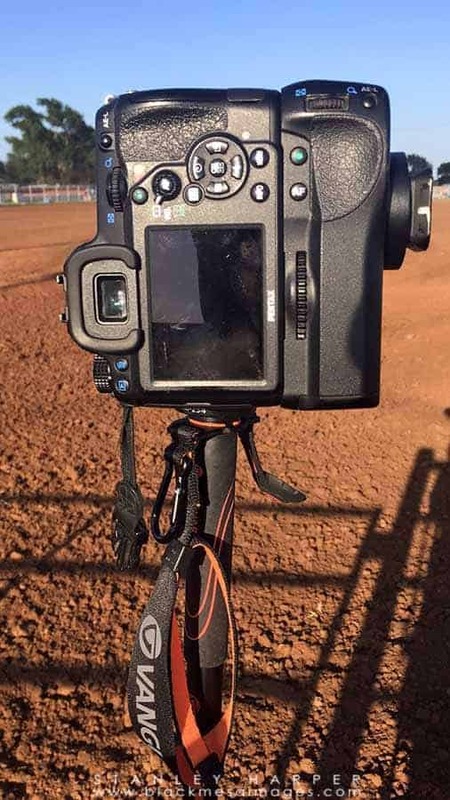 Although one image included with this review shows the monopod supporting my camera setup without any assistance, I would highly suggest against it for a DSLR. I did feel very comfortable while the monopod was collapsed fully, extended was another story. The three legs are very short so this monopod is not a favorable substitute for a tripod. Except for the fact that I shot a long time lapse using my action camera mounted to the monopod early one morning. There was no breeze, the action camera weighs almost next to nothing and during a review of the video, I could see no movement that could be attributed to the monopod. The Vanguard AM-264TR monopod is an excellent piece of gear. 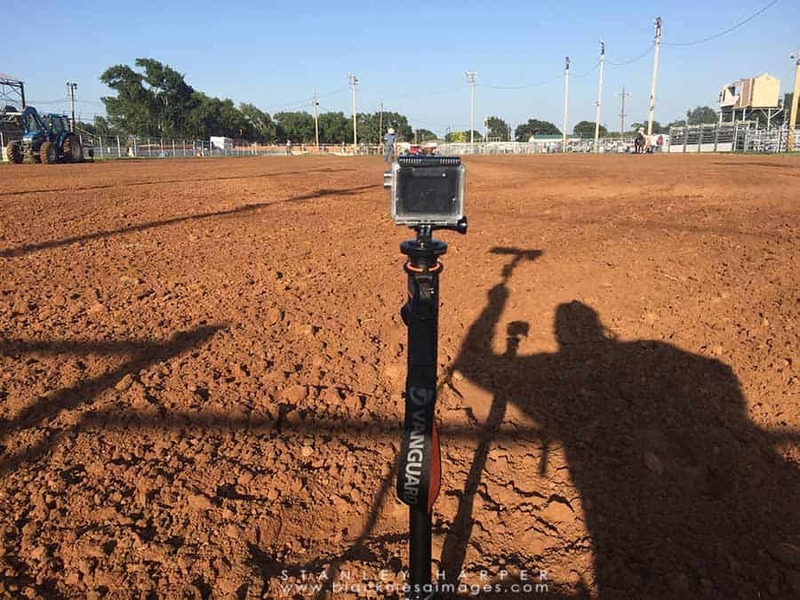 I shoot sports and time lapse with my action camera and this monopod is an excellent addition to my inventory. I would highly suggest it for anyone who is shopping for a monopod and for a current as of the date of publishing of this article, you can have this same monopod for $89.99. You can buy your own Vanguard AM-264TR monopod from Amazon here. 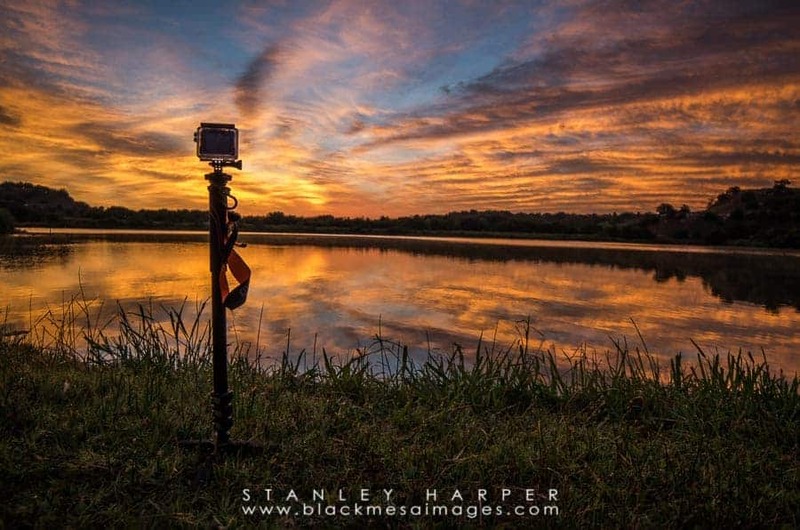 I let the monopod in on the action of helping me capture this beautiful sunrise over an Oklahoma lake recently.